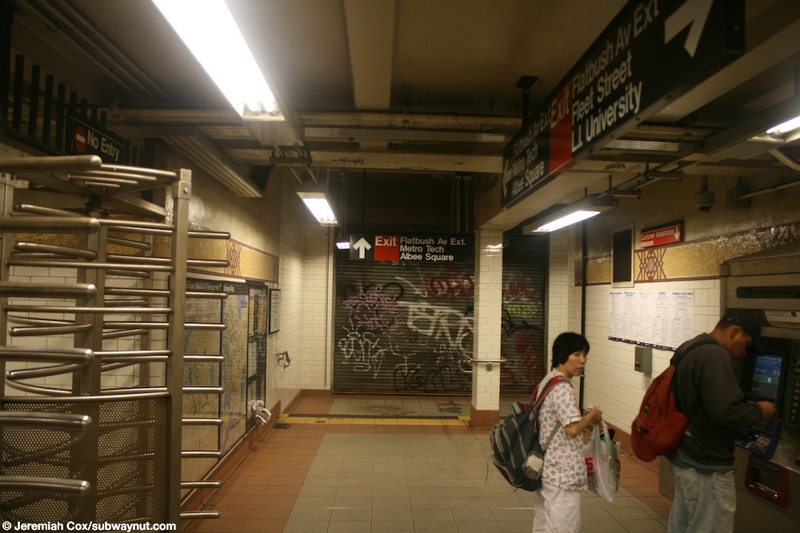 DeKalb Avenue is a very unusual six-tracked local station, with two island platforms, and two express tracks that bypass the station between the island platforms, although trains aren't all that visible because the tracks are almost completely walled in. 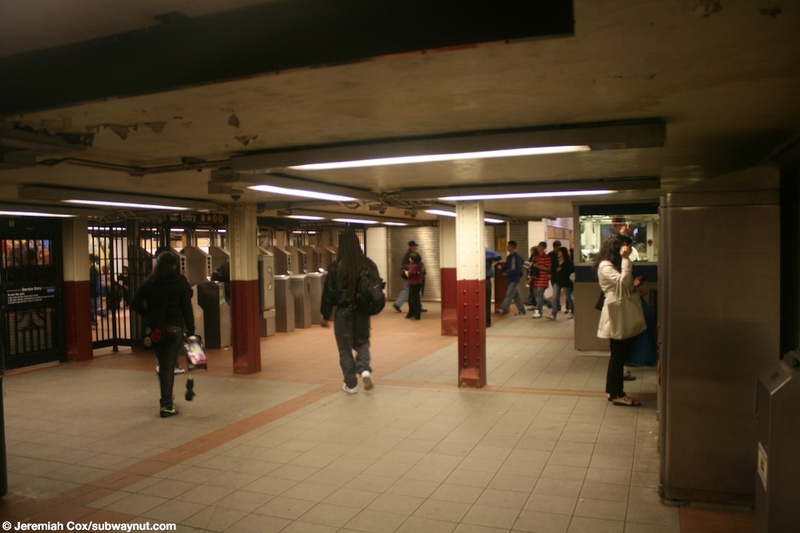 The station basically provides a transfer point from all trains that will end up on the Brighton Line (the B and the Q), these use the extreme side wall tracks, with all trains that will use the Montague Street Subway (the M and the R), that use the other two middle tracks that platform. Trains coming from the 4th Avenue Express tracks and operating via the Manhattan Bridge bypass the station (the D and N). 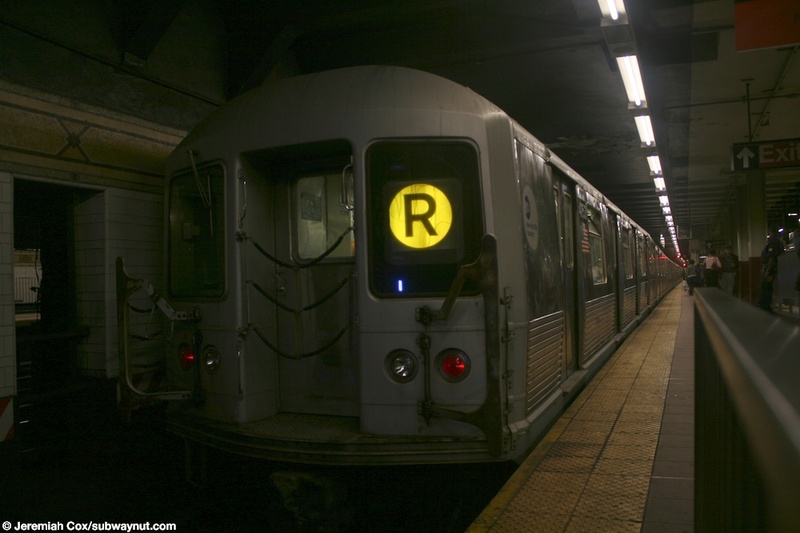 Many people have wondered why the D train can't stop at the station during weekends when the B isn't running and there isn't same platform (passengers must use the long passageway between Atlantic Avenue and Pacific Street) transfer from the Brighton Line train (the Q), to a train (the D) via 6th Avenue. This is because in order to do this quite complex maneuver the D would have to be switched from its 4th Avenue Express track to the middle 4th Avenue Local track, and again to the Brighton Line track in order to serve the station, (all trains that want to stop at DeKalb Avenue, and are running via the Manhattan Bridge must use the Brighton Line's track). 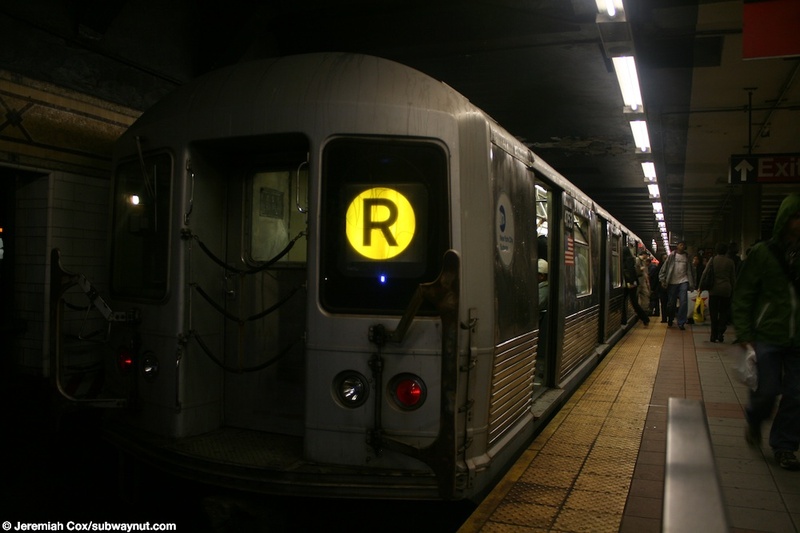 The D train does stop during late nights, on the Brighton Line's track, when its running local on 4th Avenue anyway, and might as well be switched off onto that track to access 6th Avenue, instead of onto its express track. 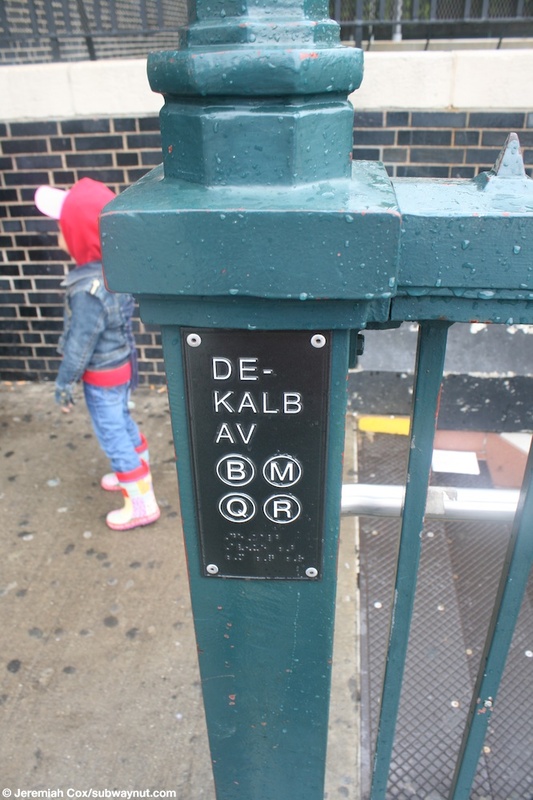 The final destinations of trains that are stopped at DeKalb Avenue can be rather confusing, so signs along each track light up depending upon the routing and destination of the train that has stopped. The layout of the exits in the station are also a bit confusing. The main exit/entrance, with fully staffed fare control and turnstiles is towards the southern (eastern) end of the station's platforms. It's a decently sized mezzanine area, with a free crossover and two staircases and an elevator down to each platform. 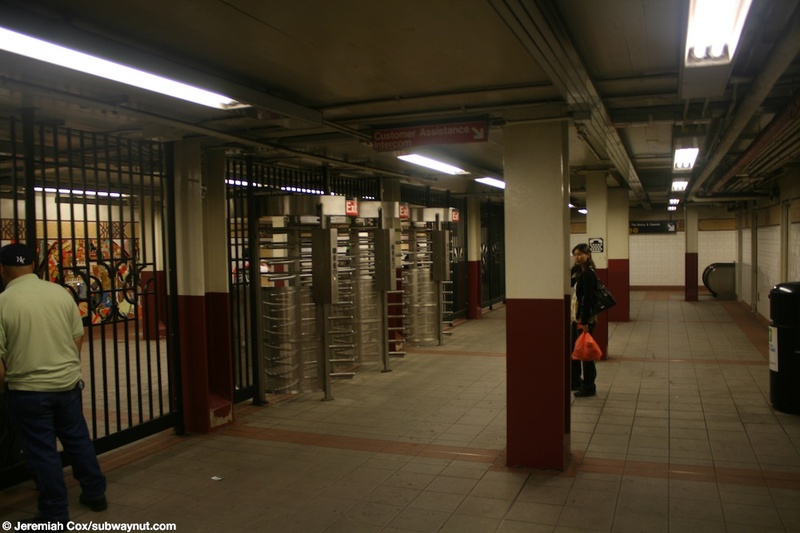 The main, wide station entrance, where there's basically a double staircase down to the mezzanine and the elevator up to the street is at the SE corner of DeKalb Avenue and Flatbush Avenue Extension, tucked beneath a plaza at an entrance to a large building, beneath an Applebee's. There is a secondary station entrance across the street, near the SW street corner. This entrance is alongside storefronts. 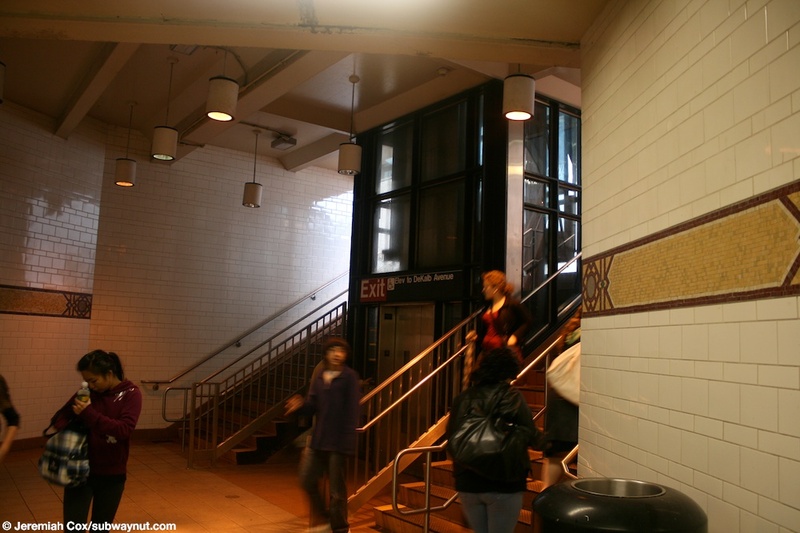 Just after the turnstiles in the mezzanine area, between the staircases down to the Manhattan-bound track is a paif of subway restrooms that are open between 5am and midnight, the usual subway public bathroom hours. In the middle of the platform is a small crossover with single staircases up to it from each platform. There are some doors alongside the passageway that goes over the tracks. This gives me the impression that at one time the station had a larger mezzanine that was carved up for other uses. The station has a secondary exit at the extreme northern (western) ends of the platforms. At this point the island platforms start becoming two levels. 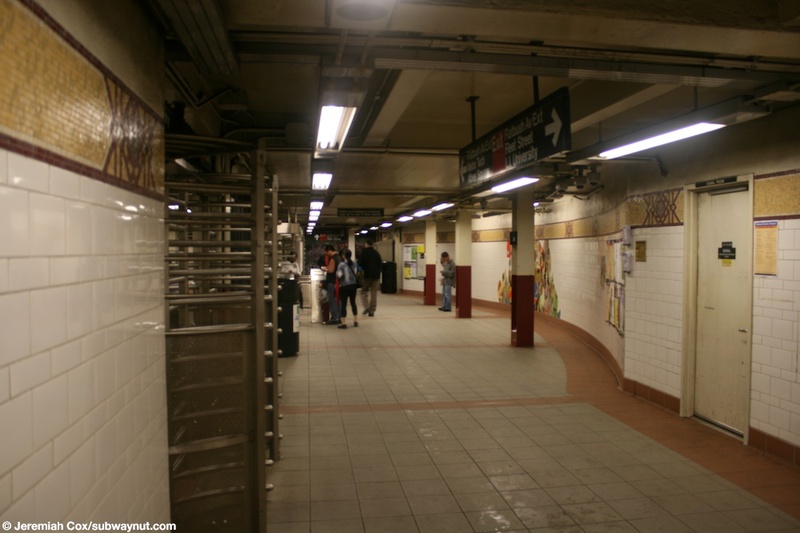 A higher level for the Brighton Line tracks that are to reach the Manhattan Bridge, and lower-level tracks that become the line that goes through the Montague Street Tunnel. 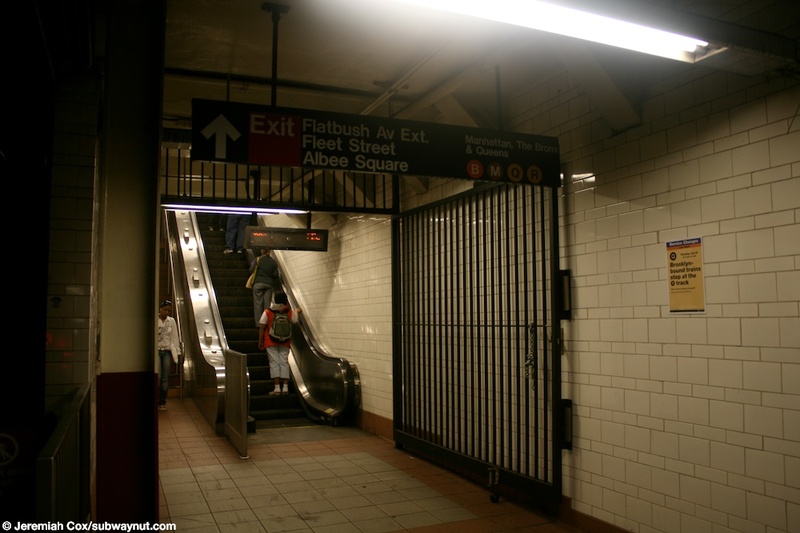 A staircase that is a bit long is alongside a arrow escalator, that is in the 'up' direction (from both platforms) leads up to another, small mezzanine area that is now fully automated, with High Entrance/Exit Turnstiles, and exits to either side of Flatbush Avenue Extension. 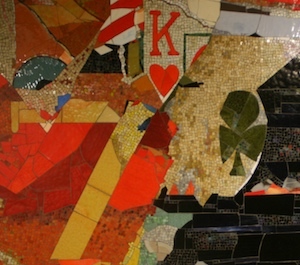 One side is at MetroTech and Albee Square, the other side to Fleet Street and L.I. University. For decorations, the station was recently renovated and all mezzanines have a traditional BMT dual-contracts style, abstract trim line that is mostly a brownish color. 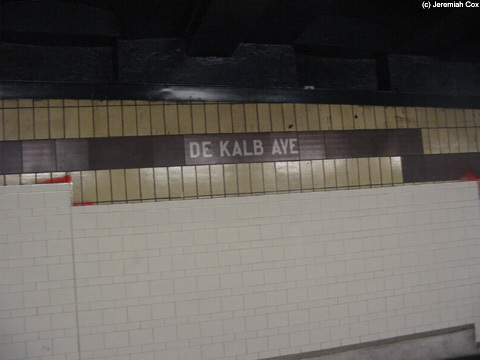 The platform walls are all tiled white, including most of the wall between the 4th Avenue Line's local tracks for trains going to the tunnel, and the express tracks that bypass the station, with a similar trim-line of a cream color with dark brown lines, and De Kalb Ave name text that is a dark tiled background with cream colored letters. This trim-line and the De Kalb Ave text is rather hard to see. 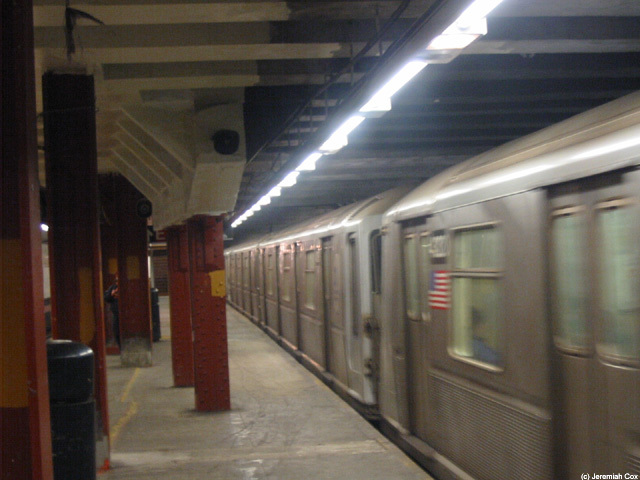 Along each track on the platforms are I-beam shaped columns that are painted a reddish-brown color for their lower third, and a cream color for their upper two-thirds. 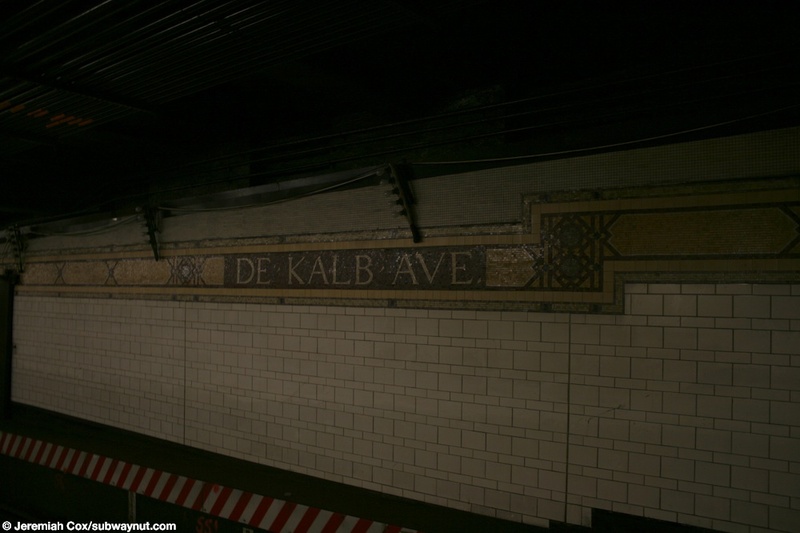 (dekalbb1) Before DeKalb Avenue's renovation it had 1960's style tiling along the track walls, with a dark brown trimline with De Kalb Ave text inside it at various intervals. The bottom half of the wall has already had white tiles laid over the 1960s cream colored ones. 30 December, 2003 (dekalbb2) The exit at the extreme northern (western) end of the station at DeKalb Avenue is closed temporarily for renovations. 30 December, 2003 (dekalbb3) Looking down one of the tracks as its being renovated at DeKalb Avenue, as a R40 Slant train blurs its way out of the station. 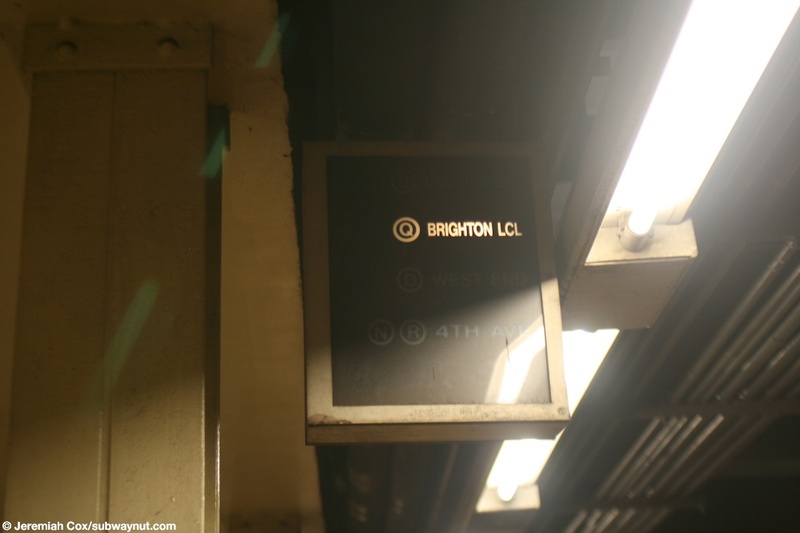 30 December, 2003 (dekalbb4) A light-up sign for the destinations of trains along the Brighton Line's local track at DeKalb Avenue, is set to Q-Brighton Local. 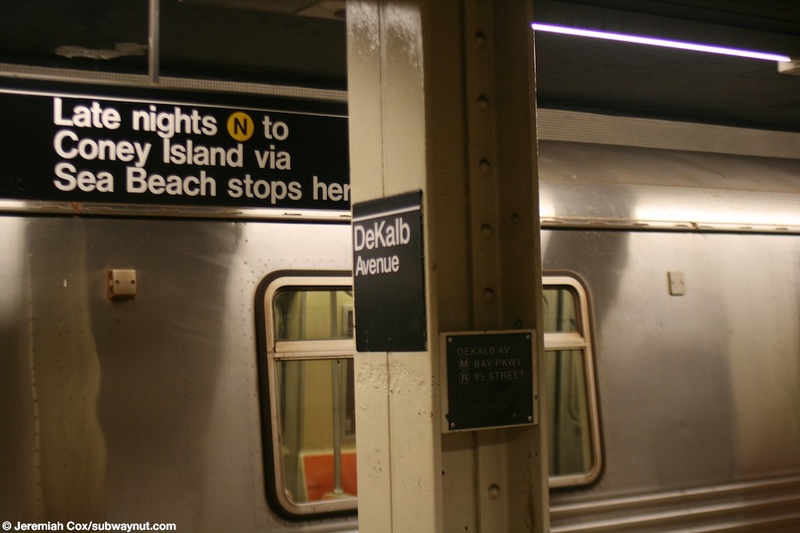 (dekalbb5) A DeKalb Avenue pillar sign with a sing on the 4th Avenue Local-bound track saying Late Nights N via Sea Beach stops here. 13 August, 2008 (dekalbb6) R42 #4753 and the back of a Bay Ridge-bound R train stopped at DeKalb Avenue. 15 June, 2009 (dekalbb7) Another view R42 #4753 and the back of a Bay Ridge-bound R train stopped at DeKalb Avenue. 15 June, 2009 (dekalbb8) The De Kalb Ave text in the mosaic trim-line along the track walls is quite hard to see because everything is so dimly lit. 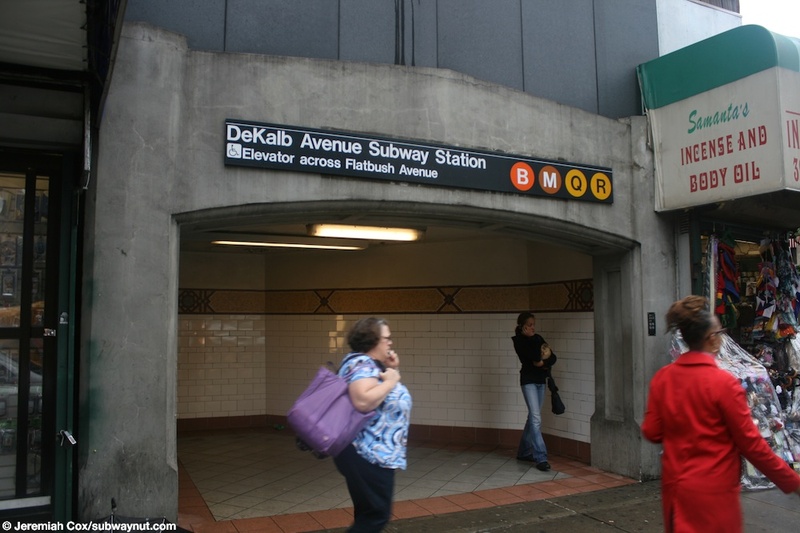 (dekalbb9) The single escalator and staircase up to the small mezzanine for the Fleet Street and Albee Square exit at DeKalb Avenue. 15 June, 2009 (dekalbb10) Looking down the small mezzanine area at DeKalb Avenue, within fare control for the unstaffed exit to Fleet Street and Albee Square. 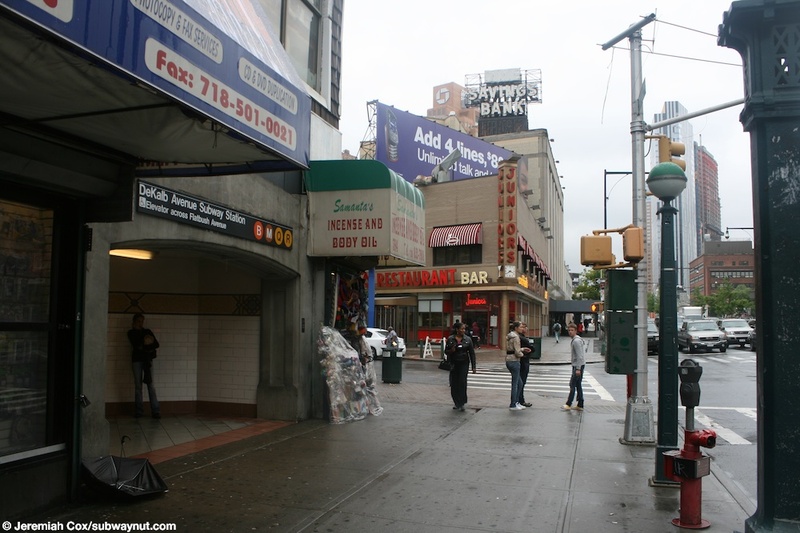 15 June, 2009 (dekalbb11) The exit near the SW corner of Flatbush Avenue Extension and DeKalb Avenue is situated off the sidewalk within a storefront. A subway entrance globe on the sidewalk makes this entrance easier to spot. 18 June, 2009 (dekalbb12) A close up of the storefront entrance to DeKalb Avenue, on the SE corner at Flatbush Avenue Ext. (dekalbb13) Looking down a passageway that connects the SE corner exit to the main mezzanine area at DeKalb Avenue. 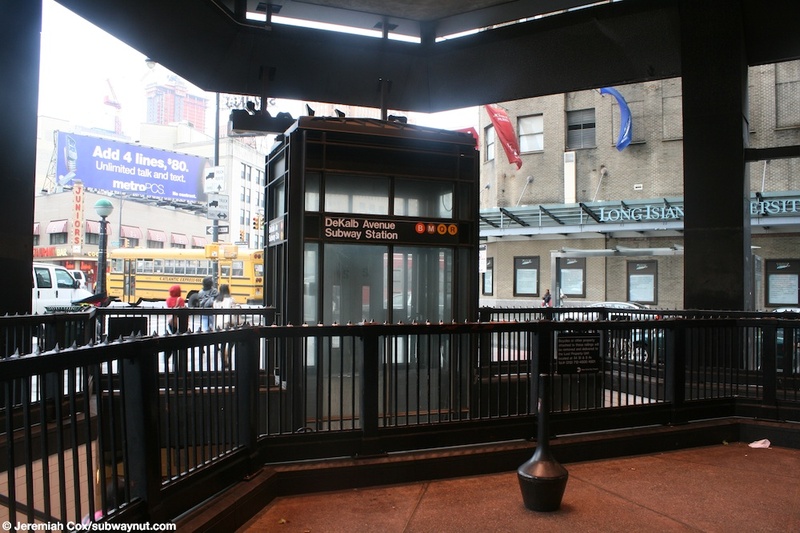 18 June, 2009 (dekalbb14) Outside of fare control at DeKalb Avenue, the token booth, turnstiles and MVMs are visible at the main entrance and mezzanine area. 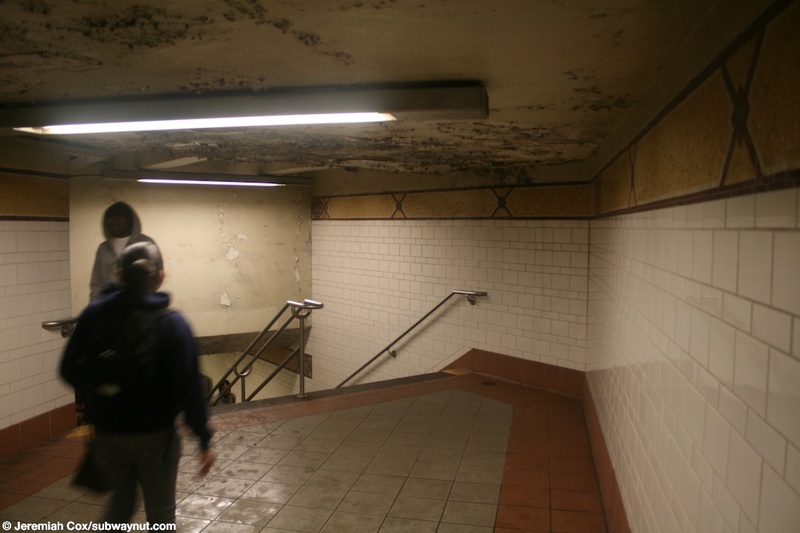 18 June, 2009 (dekalbb15) Approaching the main set of two staircases and the elevator shaft that lead out to the plaza entrance (underneath an overhanging building) at DeKalb Avenue (SE corner). 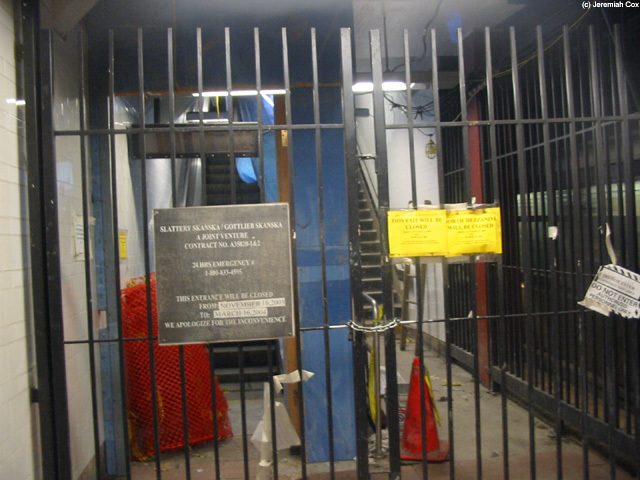 18 June, 2009 (dekalbb16) Looking out from the plaza entrance that is underneath the overhanging of a building at DeKalb Avenue, with the elevator down to the mezzanine visible, and the fencing that prevents people from falling down to the staircase area. 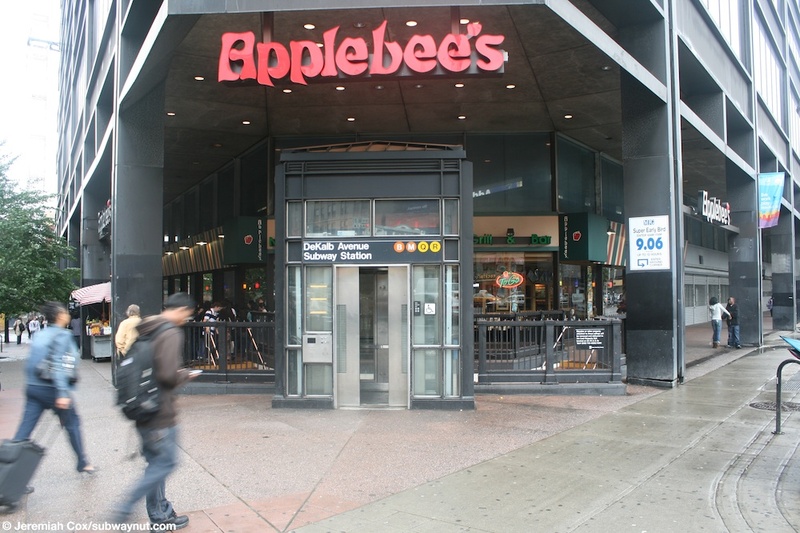 (dekalbb17) The street elevator beneath a sign for Applebee's in the plaza entrance at the SE corner to DeKalb Avenue. 29 June, 2009 (dekalbb18) ADA stenciled text on the street on one of the staircase entrances to DeKalb Avenue. 29 June, 2009 (dekalbb19) Looking down the small mezzanine area at the northern end of the station at DeKalb Avenue. 29 June, 2009 (dekalbb20) Approaching the exit out to Albee Square, from the small secondary mezzanine, at DeKalb Avenue, its just beyond a gated up area, coverd in graffiti that is in the mezzanine area.